This page provides links to online sources of information about energy and environmental impacts on our earth. They are presented randomly as they were discovered. Please send me additional sites to add to this collection. (Does anyone know how to search this text? We all know these are pivotal times. Global climate change, biodiversity loss, water woes, off-kilter ecosystems … the problems are rife. The good news? Solutions also abound. Citizens, scientists, business and non-profit leaders, policy-makers and others collectively have knowledge and insights that can change the world. What’s missing are the stories and the connections. This is where Ensia comes in. Ensia is a solutions-focused nonprofit media outlet reporting on our changing planet. Our mission is to motivate and empower people around the world to create a more sustainable future by sharing stories and igniting conversations across sectors, geographies, ideologies and disciplines. Since launching in 2013, Ensia has published nearly 500 original feature stories, articles, commentaries and multimedia pieces with content appearing in more than a dozen languages, including English, Spanish, French, German, Russian, Arabic, Portuguese, Japanese, Chinese and Bengali. We’ve cultivated a network of more than 50 leading global media outlets — including The Guardian, Business Insider, Scientific American, Public Radio International, Vox and Quartz — that republish Ensia’s content, thus increasing Ensia’s reach and impact. All told, Ensia stories influence millions of people annually and have been promoted by thought leaders across sectors, shared during legislative briefings, included in college courses and cited in publications around the world. In addition, nearly three dozen emerging communicators have been paired with experienced journalists to learn the tools of the trade and produce content through the Ensia Mentor Program — some of whom have gone on to land reporting roles at other publications, communications positions at nonprofits and expanded freelance careers. Ensia has received dozens of journalism awards. Most recently, our feature story on climate change “hot spots” was named a finalist in the 2018 Online Journalism Awards. Ensia is powered by the University of Minnesota’s Institute on the Environment and is a member of the Institute for Nonprofit News — a nationwide network of nonprofit newsrooms serving the public good — and the Solutions Journalism Network. You can find our work across the internet — Facebook, Twitter, LinkedIn, Instagram, Vimeo, YouTube and more. Ensia was established in 2013 in response to an unsettling situation: Coverage of environmental issues in mainstream media was dramatically declining, while the need to be aware of and responsive to environmental challenges was becoming more critical than ever. Ensia sought to reverse this trend by providing incisive, solutions-focused reporting on some of the most important and neglected issues of our time. Today, in a world where the media and the very idea of truth are under attack, Ensia represents a credible, nonpartisan voice shedding light on how we address the challenges we face living on a planet as the environment changes around us. Every day we work to build awareness and understanding of urgent environmental problems — and promising solutions to those problems — across sectors and ideologies. We shine a light on undercovered stories, critically examine solutions and provide a forum for underrepresented voices that are making the world a better place. We bring much-needed understanding and perspective to a tumultuous world. Our portfolio spans the spectrum from engaging online content to thought-provoking live events. 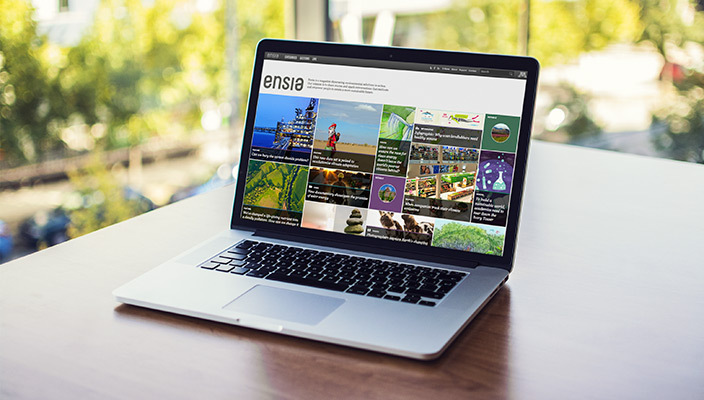 Through incisive storytelling, provocative commentaries, compelling images and engaging multimedia, ensia.com showcases solutions to the Earth’s biggest environmental challenges. Our contributors include both top-tier journalists and established and emerging leaders from around the world. Edge is where we explore pressing environmental challenges in-depth through the use of engaging multimedia storytelling. Ensia’s annual print issue uses award-winning design to share our most important, enduring stories and commentary with select thought leaders and frame conversations about issues that will be emerging in the year ahead. Ensia’s events bring the world’s best minds together around specific environmental topics to move conversations forward from global challenges to game-changing solutions. Ensia collaborates with leading media outlets around the world who share our content with a global audience in the millions. The Ensia Mentor Program gives emerging journalists and scientists a voice by inviting them to propose stories, then pairing them with seasoned environmental journalists to develop and publish their work at Ensia. We are glad to share Ensia articles under the terms of Creative Commons’ Attribution-NoDerivs 3.0 Unported license. Please be sure to attribute the writer and Ensia as the original source and link to the Ensia article at the beginning of your repost. You are also welcome to post just the beginning of an article with a link to Ensia to continue reading. Please also send an email to contact@ensia.com with a link to the republished article or feature on your site. Images and other visuals are not included in this license. For overall questions related to republishing, please email contact@ensia.com. For specific questions related to visuals, please email us. The views expressed at Ensia are those of the sources and not necessarily of Ensia, the Institute on the Environment, the University of Minnesota or other funders or partners. Ensia welcomes comments on content we publish. While we are open to airing controversial and unpopular viewpoints, comments, like the rest of our content, should move conversations forward constructively toward solutions. We reserve the right to edit or to choose not to publish comments we deem to contain inappropriate content, including name calling, offensive language, verbal abuse, etc. Comments that are self-promoting in nature and offer little to the conversation will likely not be approved. Ensia’s online and print magazine and event series is made possible through the support of the University of Minnesota’s Institute on the Environment, grants and contributions from the Gordon and Betty Moore Foundation, the Rita Allen Foundation, the Stanley Family Foundation, and donations from private individuals, including Jeff and Mary Werbalowsky, Ross and Bridget Levin, Todd Reubold (Ensia publisher), and donors who have contributed less than $1,000 each annually. Ensia also receives support from NewsMatch — a national matching gift campaign for nonprofit newsrooms supported by Democracy Fund, the John S. and James L. Knight Foundation, the Jonathan Logan Family Foundation, the John D. and Catherine T. MacArthur Foundation, the Ethics and Excellence in Journalism Foundation and the Facebook Journalism Project, along with supporting partners across the U.S.
At Ensia, we recognize that journalistic integrity is key to success in accomplishing our mission, and we are committed to doing our work honestly, fairly, transparently and with excellence. Our code of ethics, produced using guidance from the Online News Association’s Build Your Own Ethics Code project and the ethics codes of other online and print publications and journalism organizations, offers some specific examples of what we do and do not do to achieve this goal. To learn more, download the Ensia ethics statement. Ensia’s online and print magazine, event series and multimedia productions have received national and international recognition. The awards are a testament to the creativity and dedication of the Ensia team and its commitment to excellence in environmental communications. Ensia has been recognized with over 100 regional and national editorial and design awards. Our feature story on climate change “hot spots” was named a finalist in the 2018 Online Journalism Awards. Ensia received Eddie and Ozzie Awards from Folio: magazine in 2014 and 2016 for overall editorial excellence. Three of our stories were included in the Notable section of the Best American Science and Nature Writing 2015. AIGA, one of the world’s largest professional organization’s for design, recognized Ensia with a Judge’s Choice Award in the 2013 (Re)design awards competition. 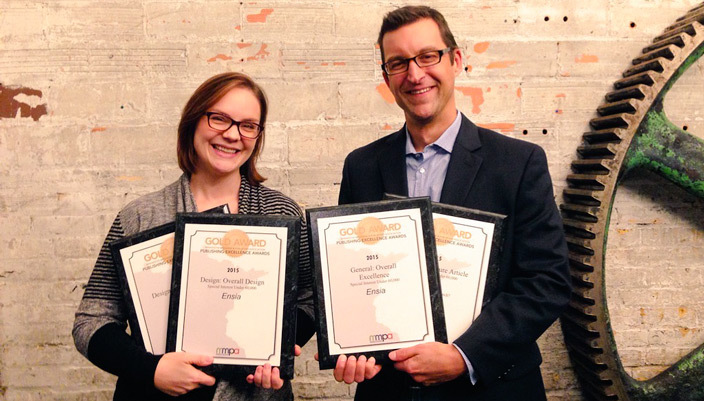 We’ve also won numerous awards from the Minnesota Magazine and Publishing Association (2016, 2015, 2014, 2013, 2012, 2011, 2010, 2009), including Gold awards for overall excellence, overall design, feature writing and more. The 2019 edition of the Sustainable Energy in America Factbook – produced for the Business Council for Sustainable Energy by BloombergNEF, provides up-to-date, accurate market information on the U.S. energy landscape. It includes an in-depth look at the energy efficiency, natural gas, and renewable energy sectors, and covers emerging technology areas such as carbon capture, utilization, and storage; sustainable transportation; and energy storage. For complete information including the links to the Executive Summary, Infographic, brochure, video, slide presentation of top findings and the Factbook, please visit: 2019 Sustainable Energy in America. Together, we can make rooftop solar the cornerstone of a modern clean energy system. is the only organization in the country dedicated to representing the needs and interests of solar owners and supporters. See how we’ve been helping people go solar, join together, and fight for their energy rights since 2007. We are a 501(c)3 non-profit. The Institute for Energy Innovation (IEI) is a Michigan-based non-profit that works to promote greater public understanding of advanced energy and its economic potential for Michigan, and to inform the policy and public discussion on Michigan’s energy challenges and opportunities. IEI is governed by a group of energy leaders with deep connections to industry, research, finance, and policy. We focus our activity in providing unbiased, research-driven reports and undertaking community initiatives that actively apply what we’ve learned in innovative settings, earning success even in areas where others have struggled and creating replicable models. In 1985, the Committee For A Constructive Tomorrow (CFACT) was founded to promote a much-needed, positive alternative voice on issues of environment and development. Its co-founders, David Rothbard and Craig Rucker, strongly believed the power of the market combined with the applications of safe technologies could offer humanity practical solutions to many of the world’s most pressing concerns. A number of leading scientists, academics, and policy leaders soon joined them, along with thousands of citizens from around the U.S. and around the world. Today, CFACT is a respected Washington D.C.-based organization whose voice can be heard relentlessly infusing the public-interest debate with a balanced perspective on environmental stewardship and other important issues. With an influential and impressive scientific advisory board, effective collegiate program on U.S. college campuses, CFACT Europe, official United Nations’ NGO representation, Adopt-A-Village project, Global Social Responsibility program, and “Just the Facts” daily national radio commentary, CFACT continues to offer genuine solutions to today’s most important global challenges. Prospering Lives. CFACT works to help people find better ways to provide for food, water, energy and other essential human services. Promoting Progress. CFACT advocates the use of safe, affordable technologies and the pursuit of economic policies that reduce pollution and waste, and maximize the use of resources. Protecting the Earth. CFACT helps protect the earth through wise stewardship of the land and its wildlife. Providing Education. CFACT educates various sectors of the public about important facts and practical solutions regarding environmental concerns. Select your market from the dropdown menu to see wind and solar electricity generation information from yesterday and forecasts for today and tomorrow. Electricity Generated (Megawatt-hours) – Estimated total amount of electricity generated. One megawatt-hour is the electricity used to light 10,000 100-watt light bulbs for 1 hour. Percent of Homes Powered – Number of homes powered divided by the total number of homes in the geographic area. Values over 100% indicate that electricity generation exceeds the sum of electricity used in all homes. Percent of Daily Cost Saved – Percentage of daily electricity cost saved by a household with an average-sized solar array on its roof versus using power only from the grid. Solar Power Index (0 to 10) – Daily solar power potential scaled to a maximum of 10. Maximum value corresponds to clear sky with average atmospheric conditions (aerosols and water vapor content) on the date. Wind Power Index (0 to 10) – Daily wind power potential scaled to a maximum of 10. Maximum value occurs when all turbines in the geographic area during the entire forecast period operate at rated capacity. A typical wind turbine operates at rated capacity at wind speeds above about 14 m/s and shuts down at wind speeds of about 25 m/s. DMA – Television Designated Market Area, as defined by Nielsen. Region – The specific eGRID (Emissions & Generation Resource Integrated Database) region as defined by the EPA. See methodology for discussion of eGRID regions. Accessing accurate climate information, education, and interpretation is critical for policy makers and all sectors of Ohio’s economy and will enhance the quality of life, health, food and water security, and economic prosperity of all Ohioans. The State Climate Office of Ohio (SCOO) is a new team based at The Ohio State University (OSU) that connects Ohioans with transformative climate information. SCOO embodies four core mission activities focused on connecting people and climate: Communication, Information Services, Education & Outreach, and Research. We have already forged many partnerships that should yield positive impacts with regard to climate-related engagement and communication, including connections with OSU Extension in the College of Food, Agriculture, and Environmental Science (CFAES) and its associated instrumental observation network, the Ohio Agricultural Research and Development Center (OARDC) Weather Network; the Ohio Emergency Management Agency (OEMA); and the Midwest Regional Climate Center (MRCC). Key climate-related questions require engagement of experts from many disciplines, sectors (energy, security, food, health), and institutions, underlain and sustained by transformative data stewardship that facilitates a climate aware and resilient society. How will Ohio adapt and build resilience to a warmer world? What will be the imprint of climate variability on our economy, food security, natural resources, energy infrastructure, health and well-being? What are the chances and potential manifestations of extreme floods and droughts? How can Ohioans build resilience to actual and future climate disruptions? Though historically housed within the Department of Geography and Atmospheric Sciences Program since the termination of the federal climate program in 1973, the rebranded SCOO is a primary level partnership between the Department of Geography and the Byrd Polar and Climate Research Center (BPCRC) at OSU. Our newly expanded office is a timely convergence of scientific research, educational skills, technical expertise, and professional interconnectedness. Until the early 1970s, state climatologists and their staff were supported by the federal government. After the state climatologist program was abolished at the Federal level many attempts were made to continue funding at the individual State level. Ohio is one of the few states where this funding has never been realized. Over 75% of the funded state climatologists are affiliated with a department or center at a university while the remainder are associated with some branch of state government. Since the mid-1980s the federal government has supported regional climate centers but it has not returned to state-level support. In states with no support, the state climatologist is the person who, in written agreement with the National Climatic Data Center (NCDC) in Asheville, NC, maintains the state’s climatic archive and who is the recipient of all current state climatic data. Professor John Rayner of the Department of Geography at Ohio State was the first state climatologist under this arrangement, followed by Jeffrey Rogers. Bryan Mark, the third state climatologist, maintains efforts to archive and disseminate climate information about the state of Ohio in addition to his full-time duties of teaching, research and service at The Ohio State University. CO2.Earth is now live. I am proud that it is one of the very first websites on the internet with a .earth domain. The first .earth site to launch—democracy.earth—happened last week. This week, CO2.Earth is the site that’s rolling out, just before .earth domains open for public registration on December 19, 2015. Also, just in time for the international climate summit in Paris, CO2.Earth takes over global redistribution of CO2 data from CO2Now.org. CO2.Earth is here to track the atmospheric CO2 trend along with you. Any time you want an update for earth’s planetary vital signs, CO2.Earth points to the latest numbers. Our vision: Lead the transformation to 100% renewable energy and sustainable living for all life on earth. ASES is unique in its integrated perspectives of science, industry, policy and citizens. Together, these valuable viewpoints represent the sum of possibility that has delivered solar and renewable energy to the respected space it now occupies in the energy landscape. We remain committed to this community for the promise it holds for the future. We believe knowledge and community are a powerful combination for change. Through trusted, well-researched content and comprehensive, thoughtful perspectives, we continue to nurture a transition to a more sustainable world. Through signature publications such as Solar Today magazine and annual events like the National Solar Tour and National Solar Conference, we engage individuals, businesses and partnering groups to advance the possibilities of sustainability and renewable energy in the U.S. ASES fosters an informed, inclusive society by presenting technical data and academic research in highly relatable, engaging formats to the greater community. ASES is based in Boulder, Colorado, and is the American section of the International Solar Energy Society. ASES is a membership-based organization which makes our activity and impact in the world possible. It supports the growth of the organization and the community we support. Our members receive complimentary copies of the award-winning, quarterly Solar Today magazine and discounted access to events such as the annual National Solar Conference. Various levels of membership also include access to experts through ASES Technical Divisions, recognition in Solar Today magazine and at the National Solar Conference, and official use of the ASES logo for websites or brochures. The Center provides support to those who have suffered damage due to climate change and who seek to hold climate polluters accountable. IGSD’s newest initiative, the Center for Climate Integrity, was launched in August 2017. Our services include legal analysis, climate science expertise, communications and community engagement, fact investigation and document management, and policy. Support meritorious climate cases aimed at holding fossil fuel companies and other climate polluters liable for the damages they have caused. The Center works with partners in communities across the country to educate the public and policymakers about the massive costs of coping with the damage attributable to global warming, and the need for climate polluters to pay their fair share. We provide campaign infrastructure, resources, and strategic direction for citizens concerned about climate change, and communities working to communicate and organize around the concept of climate accountability and the polluter pays principle. We create content, coordinate across organizations, and investigate how best to engage citizens and decision makers to hold climate polluters – instead of taxpayers – accountable for these costs. Time is short to slow accelerating climate impacts, with perhaps 15 years or less remaining to stabilize climate change before self-reinforcing feedbacks and irreversible tipping points increase impacts to catastrophic and perhaps even existential proportions. Even if the U.S. and all the other Paris parties fully implement their voluntary pledges under the agreement, which is not likely, the world would not come close to staying within the 2°C warming target, let alone the more prudent 1.5°C—neither of which can guarantee climate safety given the impacts the world is already suffering today at 1°C of warming above pre-Industrial levels, and the impacts associated with today’s concentration of carbon dioxide, which include the possibility of 10 to 20 meters of sea level rise. the need to encourage fossil fuel companies to change their behavior going forward. Thanks for stopping by Earther, a destination for fearless news and analysis about our changing planet and the people who live on it. Earther’s mission is to write impactful stories about how humans are affecting life on Earth, and what that means for our collective future. We love geeking out over the weather, sharing the latest conservation success stories, and reminding you that climate change is very real. We strive to make Earther a friendly, inclusive site for everyone interested in the future of life on the Blue Marble, regardless of race, ethnicity, gender, or sexual orientation. For more on our editorial ethos and values, check out Gizmodo Media’s Editorial Code. Oil and consumer goods are moved around the world on vast ships, keeping the wheels of commerce, and vehicles, turning. Most importantly, the ocean is vital to the food chain. For perspective, that’s close to three times as heavy as all the elephants on Earth combined. Visit RealClearEnergy today for more energy news and insight. At RealClearPolitics (RCP) we’re dedicated to providing our readers with better, more insightful analysis of the most important news and policy issues of the day. This analysis will be critical in the year ahead as the new administration charges ahead with new policy and legislative initiatives. RCP’s daily editorial curation and original reporting present balanced, non-partisan analysis that empowers our readers to stay informed. Who is donating to Ohio political candidates? Your neighbors? Your boss? Rich people from out of state? A new database compiled by cleveland.com makes it easy to find out. Renewable energy is becoming a larger part of the lives of consumers – and also as those consumers demand more from the companies they work with and purchase from. We’ve compiled facts about renewable energy you can’t ignore, and the statistics to help us all better understand how we use energy. Yale Climate Connections aims to help citizens and institutions understand how the changing climate is already affecting our lives. It seeks to help individuals, corporations, media, non-governmental organizations, government agencies, academics, artists, and more learn from each other about constructive “solutions” so many are undertaking to reduce climate-related risks and wasteful energy practices. 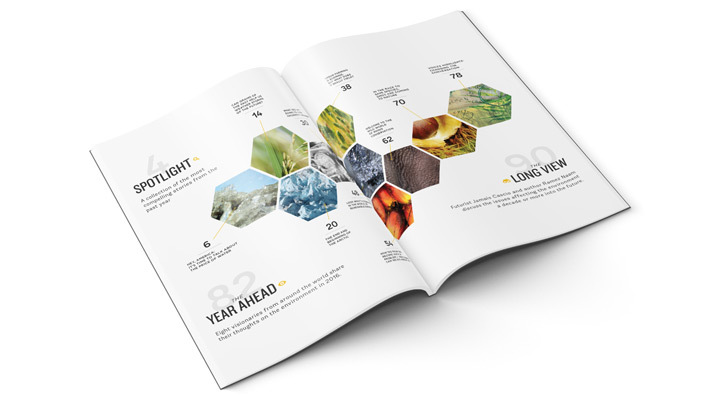 Through articles, radio stories, videos, and webinars we “connect the dots” between climate change and energy, extreme weather, public health, food and water, jobs and the economy, national security, the creative arts, and religious and moral values, among other themes. Edited by veteran journalist and journalism educator Bud Ward, Yale Climate Connections provides content developed by a network of experienced independent freelance science journalists, researchers, and educators across the country. In doing so, it brings together a dynamic global community of individuals, scientists, educators, and media and communicators in their common pursuit of better understanding and of responsibly addressing climate-related risks. We invite your participation in this vital conversation — please share your own ideas, experiences, and success stories. Yale Climate Connections is an initiative of the Yale Center for Environmental Communication (YCEC), directed by Dr. Anthony Leiserowitz of the Yale School of Forestry & Environmental Studies, Yale University. Most content is published under Creative Commons: Attribution-Noncommercial-No Derivative Works. Please provide full attribution to Yale Climate Connections and a link to our home page. We welcome and appreciate notification of your reposting. Views expressed at our website, Youtube channel, and Facebook page are those of individual authors, producers and commenters. Contact us by e-mail with any questions. We welcome your feedback and ideas. Yale Climate Connections is grateful for the generous financial support of the Grantham Foundation for the Protection of the Environment and of individual Yale University alumni. Clean Jobs Ohio presents an in-depth look at clean energy employment in Ohio. It’s based on data from survey research conducted by BW Research, a national leader in workforce and economic development research. Clean Jobs Ohio shows that while the clean energy sector is a significant employer in the state, SB 310’s freezing of the Renewable Portfolio Standard last year has forced companies to look out-of-state for customers. As such, clean energy falls far short of its potential to drive economic growth and add jobs, and lawmakers must act quickly to put better state and federal policies in place. At PowerScout, we’re passionate about making it easier for homeowners to modernize their homes and make them smart. We’ve created a marketplace that lets you compare multiple quotes for all your smart home improvement projects like home solar. We work with only the best contractors who are evaluated on our 30 point quality checklist. TheEnergyCollective.com is an independent, moderated forum of the world’s best commentary & analysis on energy policy, climate change, energy technologies and fuels, and energy innovation. TheEnergyCollective.com is the one place on the web where you can get a daily hand-curated selection of the best writing from our diverse and ever-growing community of energy and climate thought leaders. Our contributors span the globe and include industry professionals, policy makers, scientists, and experts on everything from cutting-edge clean tech products to climate change, nuclear power to renewable energy, and the latest in energy policy from Washington DC to Beijing. If you share our passion for tackling the biggest topics in energy and climate, can offer your expertise, or just want to take part in the discussion, we invite you to become a member of our community. If you’re interested in contributing content, click here for more information. TheEnergyCollective.com is published by Energy Post Productions B.V.
Environmental Professionals Network – Connecting our community. Ohio is home to thousands of environmental professionals working every day to make the world a better place. The Environmental Professionals Network (EPN) is a service of the School of Environment and Natural Resources that connects and grows environmental professionals in-person and online. Participants in the Environmental Professionals Network can access many online services and are linked to thousands of professionals in Ohio and beyond. Professionals are thus connected in a “community” of people who share their passion for our world and its environment, natural resources, people, and communities — local to global. The EPN will help you grow professionally and be more effective in your job, and be inspired about your career. “2nd Tuesdays” Breakfast Club held monthly at the Nationwide and Ohio Farm Bureau 4-H Center on Ohio State’s campus. Attend and hear compelling speakers on important, innovative topics each month. 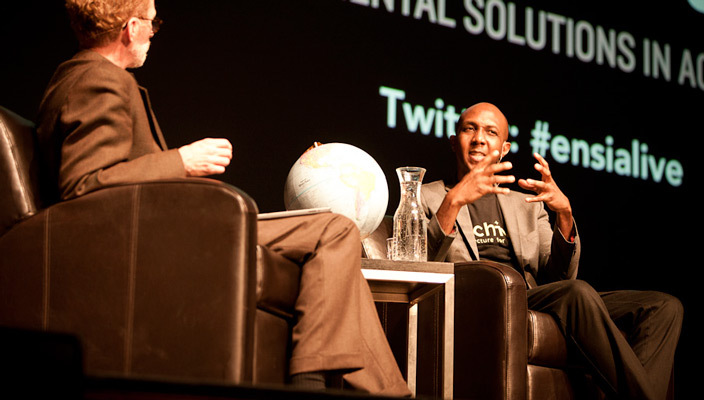 Signature network events with nationally recognized experts shaping the environmental and natural resources community. Join EPN Today and Start Connecting! Citizens’ Climate Lobby is an international grassroots environmental group that trains and supports volunteers to build relationships with their elected representatives in order to influence climate policy. Operating since 2007, the goal of CCL is to build political support across party lines to put a price on carbon, specifically a revenue neutral carbon fee and dividend at the national level. CCL is supported by notable climate scientists James Hansen, Katharine Hayhoe, and Daniel Kammen. CCL’s advisory board also includes former Secretary of State George Shultz, former US Representative Bob Inglis, actor Don Cheadle, and RESULTS founder Sam Daley-Harris. Since the beginning of the industrial revolution, our burning of fossil fuels has steadily increased the carbon dioxide context of Earth’s atmosphere. For many decades, we enjoyed the benefits of such fuels without realizing that the increased atmospheric carbon was trapping heat and hastening global climate change. Today, we understand that climate change carries potentially catastrophic health, environmental, and economic costs. Nevertheless, in most places there is no financial penalty for adding to the carbon pollution that drives climate change. As long as carbon pollution remains free, the true costs of fossil fuels will be hidden, and may appear cheaper than low-carbon alternatives even as they put long-term health and economic prosperity at risk. CCL’s preferred climate solution is known as Carbon Fee and Dividend. A national, revenue-neutral carbon fee-and-dividend system (CF&D) would place a predictable, steadily-rising price on carbon and other greenhouse gases, with all fees collected minus administrative costs being returned to households as a monthly energy dividend. In just 20 years, studies show, such a system could reduce carbon emissions to 50% of 1990 levels while adding 2.1 million jobs about baseline to the American economy. We’re a group of citizens and landowners who have come together over our concern with the potential impacts associated with horizontal hydraulic fracturing. We’re known as Athens County Fracking Action Network. Our mission is to work for the safety, economic interest, and quality of life for Athens County. Contact us at acfanohio AT gmail.com for more information. A synergy of climate experts, world leaders, nobel peace laureates, and shapers of opinion – helping create the political will to address climate change. Blog and campaign links. The Climate Change Task Force (CCTF) is an independent, non-governmental committee comprised of leading international climate change thinkers, scientists, Nobel Peace Laureates, as well as former and current Heads of State, calling upon civil society and the public at large to urgently engage in the climate debate. In the end, the aim is to build the critical mass and political will for deep-rooted societal change capable of containing and then reversing the effects of climate change. In St. Paul City Hall, there is no more debate about extreme weather. “It’s not supposed to be 65 degrees in February, or rain on Christmas,” said Anne Hunt, environmental policy director for the city of St. Paul. Through the corporate-funded American Legislative Exchange Council (ALEC), global corporations and state politicians vote behind closed doors to try to rewrite state laws that govern your rights. These so-called “model bills” reach into almost every area of American life and often directly benefit huge corporations. In ALEC’s own words, corporations have “a VOICE and a VOTE” on specific changes to the law that are then proposed in your state. DO YOU? Numerous resources to help us expose ALEC are provided. We have also created links to detailed discussions of key issues. Take the link above. The Ohio Environmental Council is the state’s most comprehensive, effective and respected environmental advocate for a healthier, more sustainable Ohio. Our experts work daily to restore, protect, and strengthen the quality of life for families and communities—from the air we breathe and the water we drink to the food we eat and natural resources we enjoy. To support democracy and promote public dialogue in a rapidly changing media environment, Public News Service (PNS) is a member-supported news service that advocates journalism in the public interest. PNS’s network of state-based news services distribute high quality public interest news and information to both mainstream and alternative media on a daily basis. Support comes from non-profit organizations, foundations, individuals and businesses for social responsibility. Recording of Webinar (8/9/16): Please don’t hesitate to reach out to Nadia, Cheryl, or Molly with questions or comments. RealClearEnergy (RCE) is the headquarters for energy and policy news. As energy policy continues to drive energy independence and economic confidence, RealClearEnergy has become an essential tool for energy policy makers, industry leaders, executives, and media. RealClearEnergy provides a comprehensive look at major energy innovations and policy updates from solar and clean coal to oil, natural gas, hydro, and wind power. RealClearEnergy is committed to elevating the conversation and providing an extensive resource for those seeking to educate themselves on all aspects of energy policy and markets. The following information is provided for those who wish to learn more about global climate change. These materials are organized from the most basic information to more complex issues. Included are a number of the international and national assessments that represent the general scientific consensus on specific topics. It is important to remember that scientists are naturally skeptical and constantly test and retest their hypotheses as more observations are obtained and as knowledge advances. Climate science, like all the sciences, builds on current knowledge to generate deeper and broader understanding. This is an ongoing process that underpins the scientific method. Below are websites where you can explore the fundamentals of the role of greenhouse gases in maintaining Earth’s energy balance, and the role of additional (anthropogenic) greenhouse gases that result in an enhanced warming of the planet. The latter is called the Enhanced Greenhouse Effect (GHE) and is an important mechanism contributing to global climate change or what is popularly called “global warming”. Global warming is a “catch all” term meaning that Earth’s globally averaged surface temperature has warmed (~0.80 °C since 1900). 1) The United States’ National Academy of Sciences (NAS) has a website devoted to Global Climate Change (GCC) (http://nas-sites.org/americasclimatechoices/). This is an excellent first step to learn more about the basics of GCC. You might start with their 2012 booklet entitled Climate Change: Evidence, Impacts and Choices (https://nas-sites.org/americasclimatechoices/more-resources-on-climatechange/climate-change-lines-of-evidence-booklet/). 2) More recently (February, 2014) the United States’ National Academy of Sciences (NAS) and the British Royal Society jointly released a report entitled “Climate Change: Evidence and Causes” that is freely available (http://dels.nas.edu/resources/static-assets/exec-office-other/climate-change-full.pdf). It is accompanied by a freely available 8 page overview of climate change basics (http://dels.nas.edu/resources/static-assets/exec-office-other/climate-change-basics.pdf). 3) The U.S. Global Change Research Program (USGCRP) coordinates and integrates federal research on changes in the global environment and their implications for society (http://www.globalchange.gov/). 4) The most authoritative documents on the issue of global climate change are produced by the Intergovernmental Panel on Climate Change (called the IPCC). The IPCC assessments are available at http://www.ipcc.ch. The Fourth Assessment was released in March 2007 and the Fifth Assessment’s Summary for Policymakers is available in draft form at (http://www.ipcc.ch/report/ar5/wg1/docs/WGIAR5_SPM_brochure_en.pdf). The full report is expected in spring 2014. In addition to the Summary for Policymakers there are reports from 3 different Working Groups (WG): WG1 (The Physical Science Basis), WG2 (Impacts, Adaptation and Vulnerability) and WG3 (Mitigation of Climate Change). The 2007 documents are all available at the IPCC site (http://www.ipcc.ch). 5) The Pew Center provides well balanced information (http://www.pewclimate.org/). The document entitled Climate Change 101 is excellent and available at http://www.c2es.org/science-impacts/climatechange-101. You can review U.S. efforts on the environment and global climate change at http://www.whitehouse.gov/energy/climate-change. A new National Scientific Climate Assessment Report will be released in spring 2014. A factsheet giving the highlights is available at (http://downloads.globalchange.gov/factsheets/NCA_factsheet.pdf). The full draft (127 MB file) is available in draft form at http://ncadac.globalchange.gov/download/NCAJan11-2013-publicreviewdraft-fulldraft.pdf . The State of the Arctic Report Card is published annually and is available at http://www.arctic.noaa.gov/reportcard/. •The Yale School of Forestry and Environmental Studies’ website has excellent content including economic information (http://environment.yale.edu/). •The New Scientist has posted an article entitled: Climate change: A guide for the perplexed. May 16 2007 at http://environment.newscientist.com/channel/earth/dn11462. This reviews 26 of the most common myths and misconceptions about climate change. •Another valuable website for data & graphs is the Goddard Institute for Space Studies: http://www.giss.nasa.gov/. There is much information and many data sets available here. • Another valuable website for data & graphs is the Climate Research Unit at the Univ. of East Anglia. http://www.cru.uea.ac.uk/. – Andrew Dessler, Introduction to Modern Climate Change, Cambridge University Press, 2012. – Andrew Dessler and Edward Parson, “The Science and Politics of Global Climate Change: A Guide to the Debate”, 2nd Edition, Cambridge Press, 2010. – David Archer, Global Warming: Understanding the Forecast, 2nd Edition. Blackwell, Malden, MA., 2011. – Burton Richter, Beyond Smoke and Mirrors: Climate Change and energy in the 21st Century, Cambridge University Press, 2010. – Henry Pollack, World Without Ice, Penguin Books, London, 2009. – David Archer, The Long Thaw: How Humans are Changing the Next 100,000 Years of Earth’s Climate, Princeton University Press, 2009. This summary was prepared by Dr. Ellen Mosley-Thompson (thompson.4@osu.edu). Much information is available on the Byrd Polar Research Center Website (http://bprc.osu.edu/) and on our group website (http://www-bprc.mps.ohio-state.edu/Icecore/front-page.html) where copies of our publications are also freely available. Unbiased guidance on everything you need to get started. The USEPA website on climate before it was “trumped.” Here is the link to that website.